Edith Simcox is now usually remembered, if at all, as the woman who recorded in a secret journal ('Autobiography of a Shirt Maker') her passionate and physically unrequited love for George Eliot. Yet to her contemporaries Simcox was well known as a philosopher, a distinguished translator of intellectual works from German, an incisive journalist reviewing important works written in French and German as well as English, an ethnographer, and a political activist. She was, under the pen-name 'H. Lawrenny' one of the founding contributors to the Academy in 1869 and appeared for the first time in her own person there as Edith Simcox in March 1873 shortly after writing (still as 'H. Lawrenny') her important essay on Middlemarch in January. Her acquaintance with George Eliot began that year. Simcox's Natural Law: an essay in ethics (1877) was praised in Mind, 11 (1877) as 'the most important contribution yet made to the Ethics of the Evolution theory' (p. 552). Her co-operative of women shirtmakers not only produced excellent shirts for a decade but largely fulfilled the dream with which they had set out of 'a strictly self-supporting clothes-making factory, where women should do all the work, and divide the profits among them' ('Eight Years of Co-operative Shirt-making', Nineteenth Century, June 1884, p. 1039). She composed the Constitution for the Second Socialist International. What then were the incentives of her friendship with the more conservative Marian Lewes? One undoubtedly was that Marian Lewes was George Eliot, the famous novelist, whom Simcox deeply admired; another was that behind the powerful figure of the novelist lay a woman not quite at ease with herself. Understanding their relationship during the 1870s may shed light on George Eliot's late work, as well as on the struggle which engaged Simcox to find a discourse that can include sexuality and socialism, insights and inhibitions. And because friendship produces a third figure, an interlocked self that cannot be reproduced in any other circumstances, this uneven and troubled relationship changes both women. The faltering voice in the exchange below is that of George Eliot, Marian Lewes, trying to explain to her passionate friend Edith Simcox why she has 'never in all her life cared very much for women.' Edith Simcox, on the contrary, never cared very much for men. Hence their dilemma and the fascination between them. Then she tried to add what I had already imagined in explanation, that when she was young, girls and women seemed to look on her as somehow 'uncanny' while men were always kind. 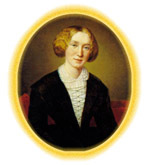 The 'uncanniness' of George Eliot interferes repeatedly in her relations with other women, despite her life-long equal friendship with Barbara Bodichon.